I finally got out of work early this week and came home to find this lovely surprise in the post from Svetlomir, my Bulgarian friend. The can looks great and the mug is one of my new favourites, the lion crest is embossed on the glass and looks magnificent! Bulgaria was one of the big beer producing countries that I didn't imagine would be that difficult to get ahold of once I started this challenge. It actually proved incredibly difficult to get, it hasn't been imported into Australia since the 1980's! This is where Svetlomir stepped in, 1 can of Boag's Draught and a Boag's mug later and I had a beautiful Kamenitza mug and can. Let's hope this beer has survived the journey! The appearance of this beer is really good for a Euro Pale Lager. The body is clear and golden with a huge off-white sudsy head. Despite it's sudsy nature the head has excellent retention and even better lacing. As far as lagers go this is one of the best looking beers on the market. I'm really impressed with it's appearance, hopefully it tastes as good as it looks! Kamenitza has an overall clean nose. It starts off with a very strong straw smell with some citrus that stings the back of the nostrils. The hops are bitter and are one of the clearest examples of Saaz hops on the market. The overall feeling that the nose left me with was a slightly earthy one, which seems somewhat odd considering the aroma's I had previously described... That aside it's a really clean smelling lager which is quite impressive. The most important category for any beer is the taste and Kamenitza certainly gets good marks in this department! It has a nice straw base to the beer with moderate carbonation that makes the beer incredibly refreshing. The Saaz hops are big and strong and give the beer more than enough bitterness to make it drinkable. I'm actually a really big fan of this beer, Bulgarian's have it good with their national lager! 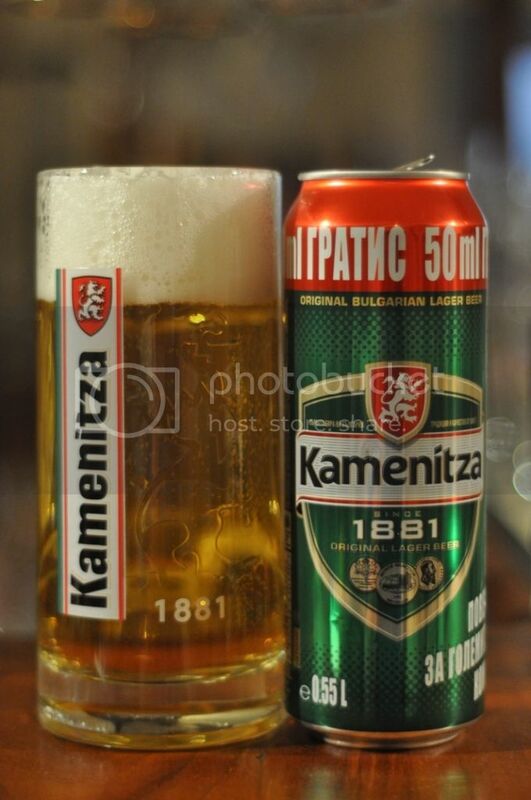 Bulgaria's national lager, Kamenitza, is one of the better macro lagers out there. That's a claim that I don't take lightly as I specialize (against some people's better judgement) in macro lagers. Kamenitza is very easy drinking with good flavours and moderate carbonation. It's a beer that I would highly recommend if you are ever in Bulgaria and it's a beer that an importer would be silly not to at least consider importing... Once again a huge thank you to Svetlomir!